Hyperion&acutes miniature nuclear modules could be easily transported and buried underground, with the ability to power up to 20, 000 homes. "Our goal is to generate electricity for 10 cents a watt anywhere in the world, " said John Deal, CEO of Hyperion. 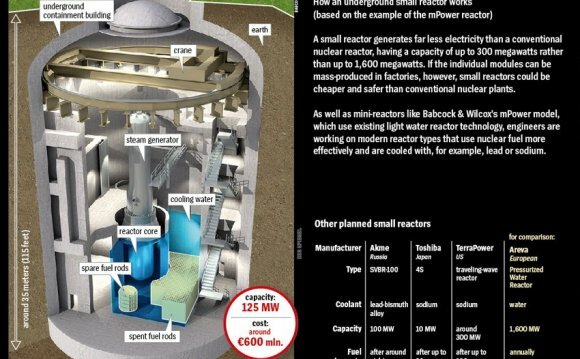 "[The nuclear plants] will cost approximately $25 million each. For a community with 10, 000 households, that is a very affordable $2, 500 per home." Because of their small size, the mini power plants can be assembled relatively quickly and transported by truck, rail or ship to remote locations, even places that currently do not have electricity. The power plants provide an alternative to current nuclear plants, which are large, expensive, and take about 10 years to build. Also, large-scale power plants don´t fit the needs of small populations or areas without available land. Hyperion´s modules can be connected together to provide energy for larger populations, as well. In addition, the Hyperion modules have no moving parts to wear down, and never need to be opened on site. Even if opened, the small amount of enclosed fuel would immediately cool, alleviating safety concerns. "It is impossible for the module to go supercritical, ´melt down, ´ or create any type of emergency situation, " the company states on its Web site. Because the Hyperion plants would be buried underground and guarded by a security detail, the company explains that they´ll be out of sight and safe from illegitimate uses. Further, the material inside wouldn´t be appropriate for proliferation purposes. "You would need nation-state resources in order to enrich our uranium, " Deal said. "Temperature-wise it´s too hot to handle. It would be like stealing a barbecue with your bare hands." The reactors need to be refueled about every seven to ten years. After five years of generating power, Hyperion says that the module produces a total waste of about the size of a softball, which could be a candidate for fuel recycling. Hyperion now has more than 100 orders for its modules, mostly from the oil and electricity industries. The first order came from a Czech infrastructure company called TES, which specializes in water plants and power plants. TES ordered six modules and optioned another 12, with the first planned to be located in Romania. Hyperion plans to build three manufacturing plants, with the goal of producing 4, 000 mini nuclear modules between 2013 and 2023. Next year, the company will submit an application to build the modules to the Nuclear Regulatory Commission. While acknowledging that the commercial development of mini nuclear plants is a lofty goal, Hyperion believes that the potential benefits of the technology make the effort well worthwhile. Along with bringing electricity to remote locations, the Hyperion modules could also be used to provide clean water for the 25% of the world´s population that currently does not have access to clean water. The modules can provide power to pump, clean, and process water, which in turn can help decrease disease, poverty, and social unrest.